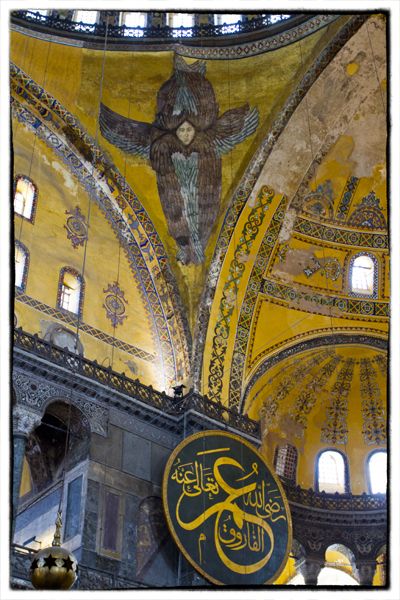 The recently uncovered angel's face at Hagia Sophia. Photo by David Lansing. One of the things I really like about the Hagia Sophia is how it’s such an obvious collision between Christianity and Islam, as well as between the East and the West. For instance, during the Byzantine period, when it served as the Greek Patriarchal cathedral of Constantinople, and then later when it was converted to a Roman Catholic cathedral by the Romans, there were a lot of amazing mosaics and frescoes and other art pieces depicting Christ and the Virgin Mary and various saints. But then the Ottomans conquered Constantinople in 1453 and Sultan Mehmed II came in to have a look at the church and said, of course, that the icons had to go since figural representations are against Islamic code. So, you know, the cross had to come down and the altar was destroyed and a lot of the mosaics and paintings were covered over. But not all of them. Up on the dome were four amazing six-winged cherubims who had probably been painted during the reconstruction of the church following a great earthquake in 989 which collapsed the Western dome arch. Well, Sultan Mehmed left the cherubs up. Maybe because they were not representations of god. Or maybe he just thought they were kind of cool looking. Anyway, the cherubims stayed. Until sometime in the mid 19th century when their faces were covered with Islamic gold leaf medallions. So fast forward to 1997 when restoration work began on the Hagia Sophia which was in very bad shape. The roof was cracked, ground water was causing moisture damage to the floors and walls, and all the decorative items were being damaged. For a decade, the structure underwent major work. Some of the Christian frescoes and mosaics were uncovered and restored. And, of course, there were some surprises. Like the discovery of the face of an angel up on the dome roof. Slowly and carefully, the gold leaf star that had covered the cherubim’s face for 150 years was removed. And there was this gorgeous multi-winged angel looking down from the heavens. But that was only one of the angels. It’s presumed that beneath the gold Islamic stars in the corners of the dome are three other angels, still hiding. So the question is, should those be restored as well? Because in order to slowly uncover these Christian icons you’re going to have to destroy important Islamic art. It’s a difficult decision to make and there’s a lot of controversy in Istanbul (and all of Turkey) as to how to maintain a balance between Christian and Islamic cultures. And there’s no easy answer.